Have a question about the IST ME55 Pro Ear 2000 Sealed Dive Mask? Pressure equalization can be very easily achieved with IST ProEar mask. Difficulty in equalising and potential ear infection are problems that can happen to any diver regardless of their experience. It can become serious enough to stop one from diving. Solution? The IST ProEar Mask is manufactured to the highest standard and only the best available materials are used. It is designed to counter the most of the unavoidable effects pressure and water have on the ears so you can have more enjoyment underwater. The Skirt is made from the best grade of hypoallergenic silicone, the skirt is soft and automatically conforms to a wide range of facial profiles. The Strap is mounted on swivel buckles, the silicone strap with its large contact surface secures the mask to the wearer. The soft silicone Ear Covers forms a water tight seal between the ear drum and the cover. The pressure buffer created has the same pressure as your nasal cavity mask when air exhaled through the nose is introduced through the Equalization Tubes. Therefore the pressure experienced in your middle ear and outer ear is the same and the "squeeze" from the ambient will be significantly reduced. Other benefits by keeping the ears sealed include reduced chance of an ear infection from water, improved sense of direction and warmth retention. With one-way valve placed inside each equalization tube, air is allowed to travel from the mask to the ear covers for pressure equalization and water clearance while stopping water from flooding the mask in the unlikely event of flooded Ear Covers. Prevents pressure induced ear ache. Enhanced underwater hearing and sense of direction. Stops dirty / polluted water from entering the ear causing infection. Excellent for snorkeling as well as diving. Fits Medium to Large faces. 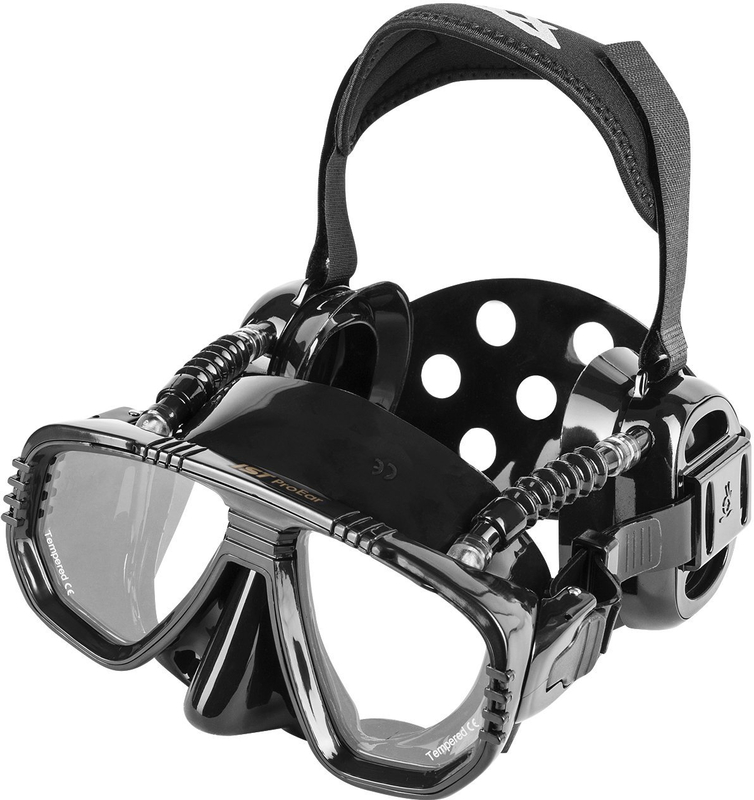 Improves diver comfort and prevents painful ear problems. Improves hearing and sense of direction underwater. Simplifies equalization of pressures while diving. Perfect for cold water diving. Perfect for use in any environment where you wouldn't want the water to enter your ear canals. on 11/8/2010 Hello yes if the shadow fits you today then this one should work fine. That said simply place an order and in the notes write in your customs request. on 9/14/2013 Hello, This mask does just that, no water in your ears and you can still equalize easily. on 5/10/2017 Can I get these in prescription? on 2/13/2018 Do you have these in stock at your location? Available for pick-up? on 2/14/2018 Thanks for your email. I do not have one in stock but if you place your order today, we can have it in our shop by Friday for pick up. I do have the ME80 in black or blue available for pick up today. If you have any other questions, please let us know. on 4/12/2018 Hi, I have a smaller framed face and use a junior sized mask. The main reason is the sides of the mask on the outside of my mask by my hairline always leaks with regular sized masks. I have been having ear problems for years and have been working with a DAN ENT. I think this would help but worried about the size.